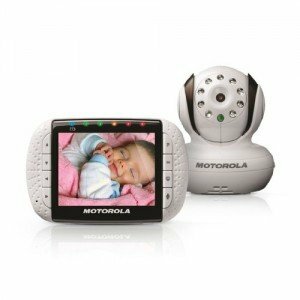 Motorola Baby Monitor MBP36 with remote wireless Video with 3.5-Inch Color LCD Screen, Infrared Night Vision and Remote Camera Pan, Tilt, and Zoom as the original product name is. This Motorola baby monitor MBP36 works on the 2.4 GHz and uses wireless technology. The 3.5 inch screen with infrared vision and also reads the temperature in the baby’s room. large, easy to us. The pictures in both daytime and night vision are very good. The sound and talk back on both units is good. The ability to add additional cameras. Lullaby and alarm work as advertised. Here are the top cons for this Motorola MBP36. Read some remarks about the charger not being to great and failing after a while. Read our tips form real users about this issue. Customer service receives some good ratings as long as the product is in the warranty period. After that you are basically out of luck. 1247 Customer reviews and an average rating of 3.7 seems a pretty good score. But like always I like to look at the low ratings first to see if somethings are returning complains. It seems to me that the low ratings are most caused by the Motorola mbp36 baby monitor stop working after a short period. I read comments between right away and 7 months. This is of-course a disappointing experience, but that is why there is a one year warranty. Like always we recommend returning any product that does not work the way it should. With about 73% of the ratings going to a 5,4 and 3 star rating I believe the Motorola mbp36 is a good buy. The price is a little high, but most of the time you get what you pay for. Overall this baby Motorola baby monitor gets great reviews and most people are happy with it an would recommend it to friends and family. You can read our how to choose the right baby monitor article here for some tips. After resetting the monitor and camera for 20 minutes (unplug and turn off), this resets the software and I was able to reset the system.